The Japanese anime series DEATH NOTE is based on the manga by Tsugumi Ohba and Takeshi Obata. 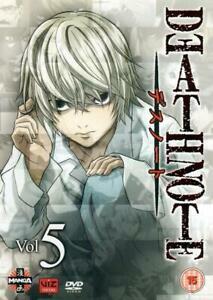 The simple premise revolves around a high school student named Light Yagami, who discovers a special notebook. The book allows him to kill anyone whose name he writes in the book, and he sets about ridding the world of various evildoers. In this fifth instalment of the anime series Light discovers that a similar notebook has fallen into the hands of a huge corporation, who are using its powers to eliminate rival businessmen.